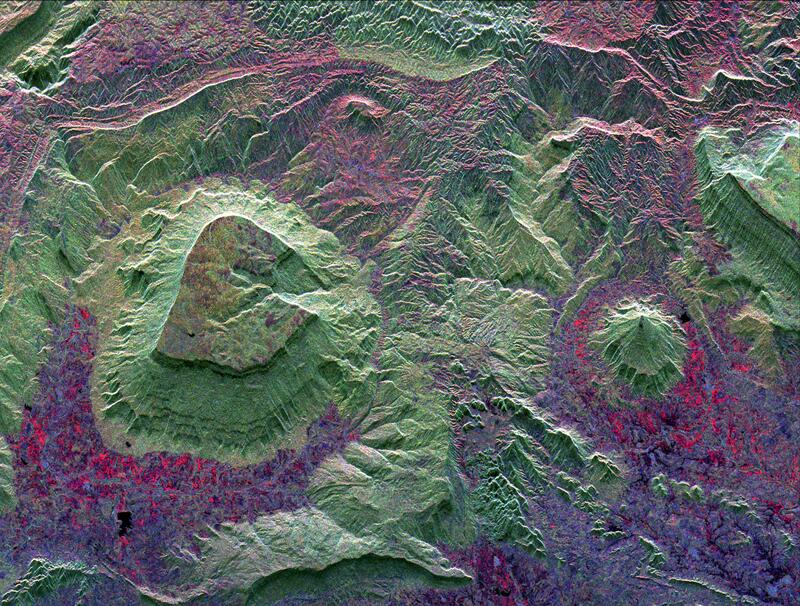 This radar image shows the dramatic landscape in the Phang Hoei Range of north central Thailand, about 40 kilometers (25 miles) northeast of the city of Lom Sak. The plateau, shown in green to the left of center, is the area of Phu Kradung National Park. This plateau is a remnant of a once larger plateau, another portion of which is seen along the right side of the image. 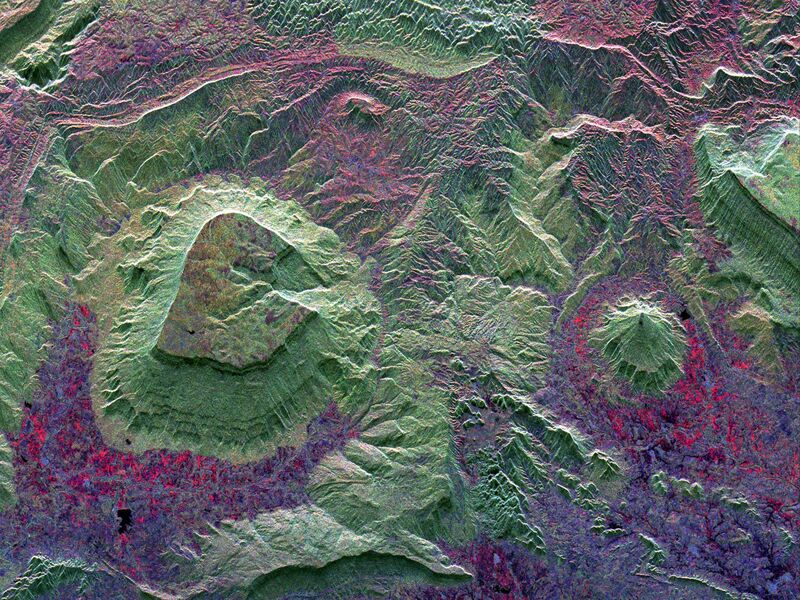 The plateaus have been dissected by water erosion over thousands of years. Forest areas appear green on the image; agricultural areas and settlements appear as red and blue. North is toward the lower right. The area shown is 38 by 50 kilometers (24 by 31 miles) and is centered at 16.96 degrees north latitude, 101.67 degrees east longitude. Colors are assigned to different radar frequencies and polarizations as follows: red is L-band horizontally transmitted and horizontally received; green is L-band horizontally transmitted and vertically received; blue is C-band horizontally transmitted and vertically received. 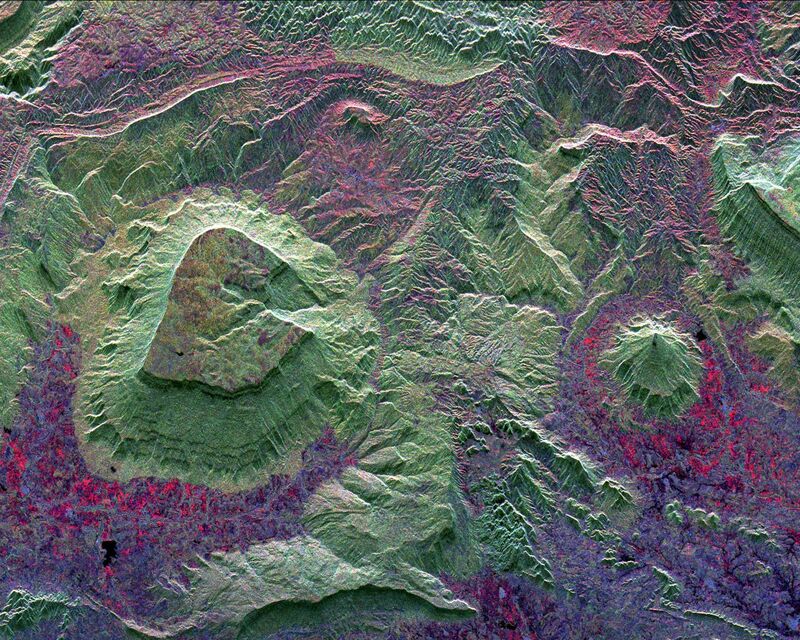 The image was acquired by the Spaceborne Imaging Radar-C/X-band Synthetic Aperture (SIR-C/X-SAR) imaging radar on October 3, 1994, when it flew aboard the space shuttle Endeavour. SIR-C/X-SAR is a joint mission of the U.S./German and Italian space agencies. 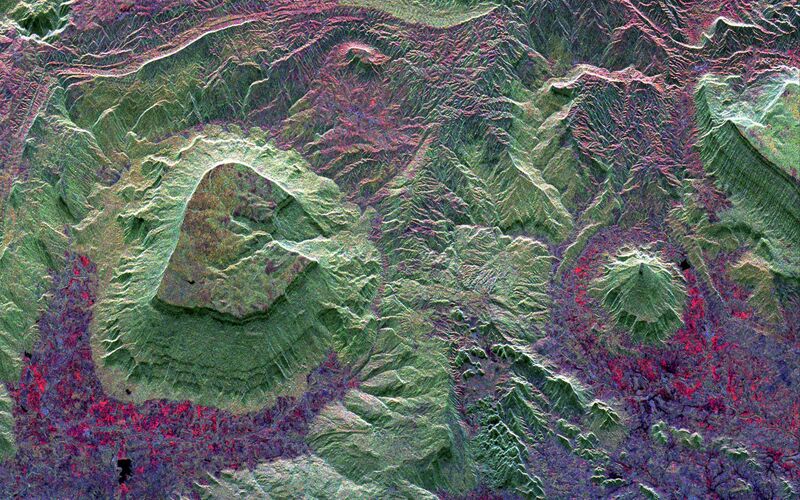 Spaceborne Imaging Radar-C and X-Band Synthetic Aperture Radar (SIR-C/X-SAR) is part of NASA's Mission to Planet Earth. The radars illuminate Earth with microwaves allowing detailed observations at any time, regardless of weather or sunlight conditions. SIR-C/X-SAR uses three microwave wavelengths: L-band (24 cm), C-band (6 cm) and X-band (3 cm). The multi-frequency data will be used by the international scientific community to better understand the global environment and how it is changing. The SIR-C/X-SAR data, complemented by aircraft and ground studies, will give scientists clearer insights into those environmental changes which are caused by nature and those changes which are induced by human activity. SIR-C was developed by NASA's Jet Propulsion Laboratory. X-SAR was developed by the Dornier and Alenia Spazio companies for the German space agency, Deutsche Agentur fuer Raumfahrtangelegenheiten (DARA), and the Italian space agency, Agenzia Spaziale Italiana (ASI), with the Deutsche Forschungsanstalt fuer Luft und Raumfahrt e.v. (DLR), the major partner in science, operations, and data processing of X-SAR.